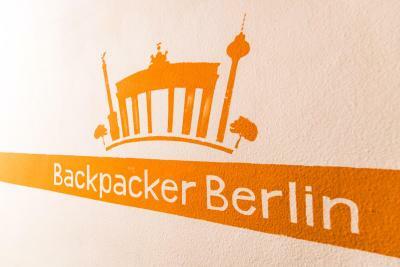 Lock in a great price for BackpackerBerlin – rated 8 by recent guests! The staff were extremely helpful and friendly. They helped me find my way around the city. They do not provide breakfast but at the common room there is always free coffee & tea and cereal and milk, which may be even better than having a regular breakfast instead. 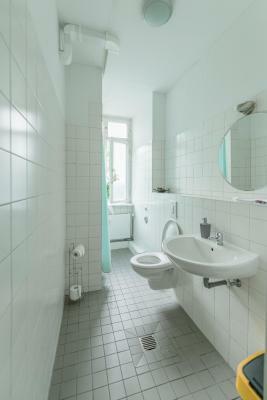 Bathrooms were cleaned daily and were always pretty nice. 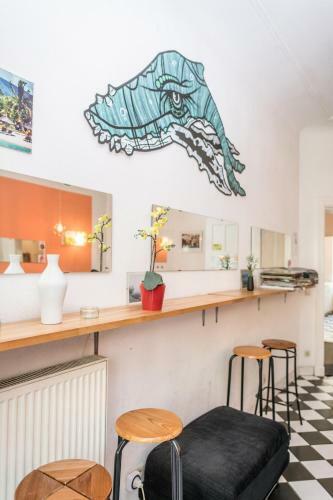 Also, it is right in the center of Friedrichshain, which is a wonderful neighborhood! 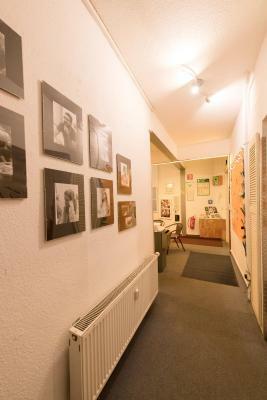 The hostel is in a really cool area in Berlin, a lot of bars a cultural centers. We booked a private room for two and it was very confortable and clean. But what we liked more was the stuff! Johnny was great with us, we share some mates and beers as well and he made our stayed super memorable in the hostel and in Berlin! 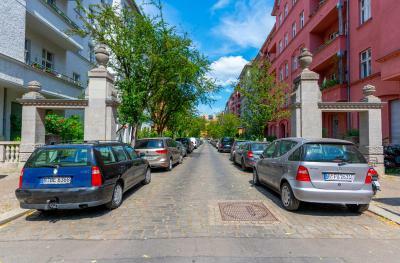 The location is great as it's a very interesting neighborhood of Berlin, full of restaurants, bars and cafes. We booked the double room and it was quite clean and comfy. The staff at the reception was friendly. The room was very clean and the bed was pretty comfy as well. The staff was helpful in showing the important locations of Barcelona. Its a nice and secure place for young travelers and the staff is so kind and they even helped me and my friends book a table at a restaurant. You feel welcome. It’s a 15-20 min walk from the nearest station. Great area to be in. 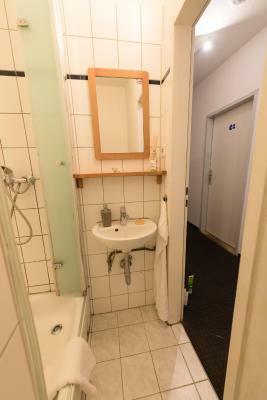 Very good location as well, close to the train station, with numerous connections, including to Schönefeld Airport. We arrived after midnight, and we had no problem getting in as the instructions we received were very precise. One of our best sellers in Berlin! 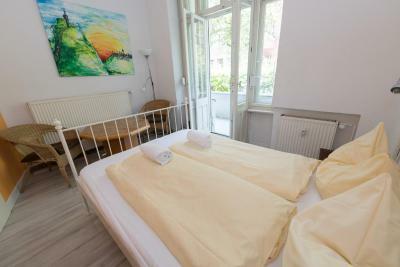 Located in Berlin’s trendy Friedrichshain district, this hostel is just 1,500 feet from Boxhagener Platz. 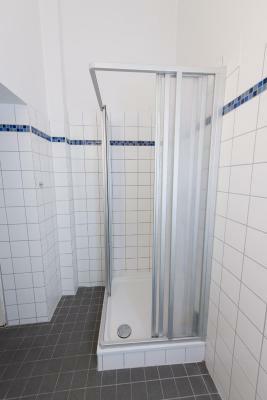 It offers rental bicycles, shared kitchen facilities and a games room. All guests are welcome to use the kitchen, which include a microwave, stove, oven and coffee making facilities. 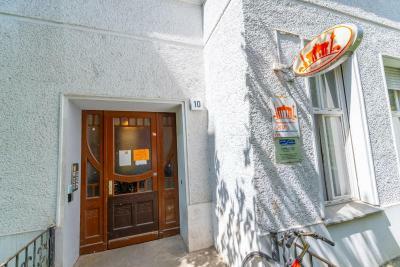 There are numerous cafés, bars and restaurants serving international cuisine within 650 feet of BackpackerBerlin. 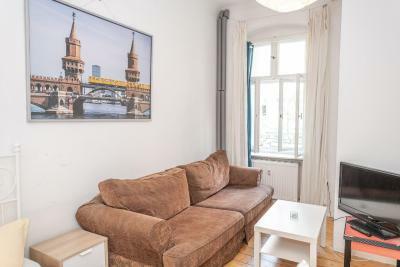 Nearby attractions include the East Side Gallery (1.6 mi), the Mercedes-Benz Arena (1.7 mi) and Alexanderplatz (2.5 mi). Ostkreuz S-Bahn Train Station is approximately 0.6 mi from BackpackerBerlin and offers easy connections around Berlin. 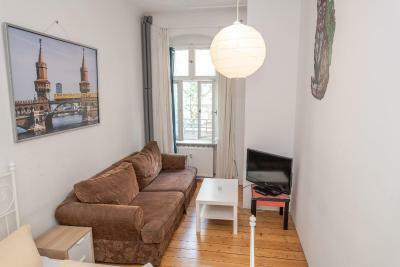 When would you like to stay at BackpackerBerlin? 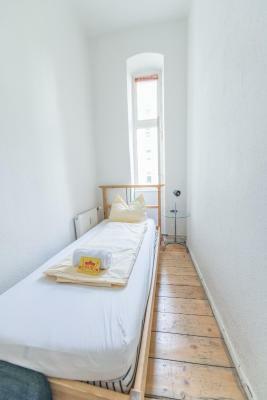 Compact room with a wardrobe and access to a shared bathroom. House Rules BackpackerBerlin takes special requests – add in the next step! Children 6 and older are allowed at this hostel. BackpackerBerlin accepts these cards and reserves the right to temporarily hold an amount prior to arrival. Please note that the reception is open daily from 08:00-00:00. Check-in before 13:00 is possible. Guests arriving after 00:00 must contact the property in advance in order to receive assistance with check-in. Once you have checked in, there is no curfew. Please inform BackpackerBerlin of your expected arrival time in advance. You can use the Special Requests box when booking, or contact the property directly using the contact details in your confirmation. The mattress was not that comfy . A thicker one would have been better. But city tripping you are tired enough to sleep well. 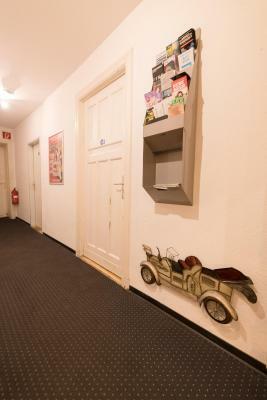 Backpacker Berlin is located in a very nice neighbourhood with a lot of bars, snacks and restaurants in a quiet street . 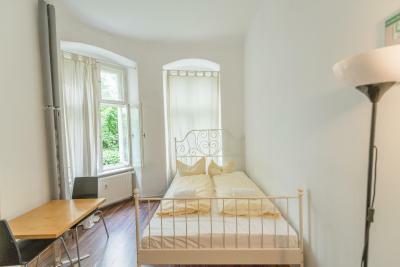 A 10 minute walk from Ostkreuz station . Easy access from Schönfeld airport by train. At the nearby Boxhagener square you have very nice foodmarket on saturday and a flea market on sunday. A lot of second hand vinyl stores in the neighbourhood. East side gallery (berlin wall ) and Ramones museum are in walking distance. The common bathrooms were clean and it felt like a private bathroom . There is a little sink in your own room that came in handy. Nice and friendly staff. Staff was very friendly. The street were the hostel is located is beautiful. It’s easily reachable. It was comfortable. Everything! This area of town is cool, lots of little cafes around. The hostel was awesome, some free breakfast even! The rooms: v.spacious. They could easily put more beds in the rooms but they haven't which is really nice and it means there's space for a table and decent sized lockers (I could easily fit my 65l rucksack). Staff are friendly and helpful. The common area a cosy place to hang out. I can't think of anything that we didn't like! The only thing I can possibly think of that could be improved is the wifi. Sometimes it was super fast but sometimes we couldn't connect. But that really wasn't a big issue for us, the hostel was so lovely it made up for that! We absolutely loved the hostel! Upon arriving we immediately felt happy and relaxed as the staff were so friendly and the reception and common areas were so chilled out. The kitchen is lovely, functional and clean, we made snacks and cups of tea each night and also cooked our own meal there one night. Oooh, and there's free tea! Which was lovely. The common room was super lovely and cosy too, a great place to sit and chill at any time of day. We stayed in B4 and loved our little room. The bed was comfy, the room was beautifully airy and light and we had everything we needed (bed, wardrobe, sofa, table, chairs and a lovely lamp too hehe). We were lucky enough to be right next door to two bathrooms and we never had to queue or wait to use the toilet or the shower. 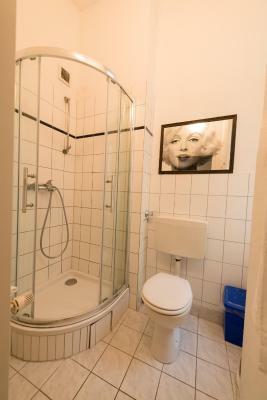 The bathrooms were clean and the shower wasn't super weak (like other hostels I've stayed in). The whole vibe of BackpackerBerlin is great and the area is amazing too, so many lovely shops and vegan cafes and eateries in walking distance. I have only good things to say about the whole place. Soooo good for the price! We highly recommend. Thank you so much for making our Berlin experience so lovely. not not liking about the place, but you should know you kind of have to check out before 11.am. keep that in mind. Wi-fi connection was not very good from my room, it almost never connected properly and even if it connected, there were no internet. I am hoping that that was just a temporary thing. The bed was uncomfortable, but the was the only downside so it didn't bother us. 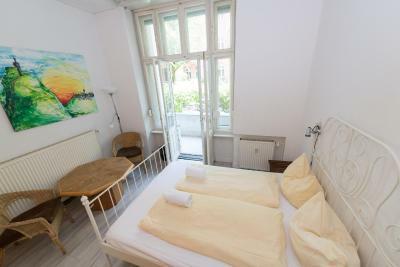 The location was perfect, 2 min walk from the nearest tram stop and 5 mins to nearest train station. 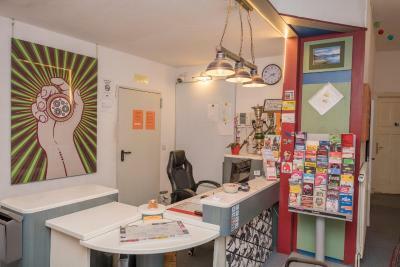 The hostel is located on the bottom floor of an apartment block and requires a key and door code for entry so very safe. Rooms and bathrooms were spotless clean. The staff were very friendly and helpful. It would have been nice to have another lamp in the room, eg. a reading lamp or something. It was annoying that you could hear everything to the hallway, even the board floor was making so much noise when people were walking there. You had to ask for towels for the room. Location was nice, the street was cute. There was no ironing board but the bed was sturdy enough to do the ironing before a meeting. It's a hostel. There's not a lot to like or dislike. The internet was through a portal rather than a normal password which didn't jive with my computer for some reason. It worked on my phone though. The staff were nice and helpful. I found my room in order and that everything was as I would have expected from a hostel. The bed was more comfortable than I had expected. I liked that there was a breakfast room with milk, cereal and coffee. A great touch at no extra cost.